GRPL 287, April 1, 1959, C 3409. This ample neighborhood theater was opened, owned, and operated by Edward N. Brown as the Stocking Avenue Theater in 1916. Already before 1922 it was known as Brown's Stocking Avenue Theater, and eventually as Brown's Stocking Theater, and was operated by Mr. Brown's wife, apparently with connections to Fleser and Callaghan. Edward Brown died prior to 1936, leaving the theater to (his son and daughter-in-law?) Walter and Marie M. Brown. After a time, they sold the theater to Howard T. Reynolds, one of the sons-in-law of Joseph Poisson. 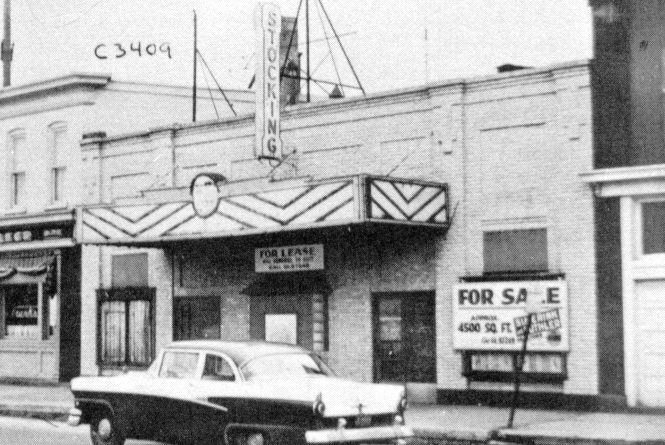 Herbert R. Boshoven acquired the theater, along with the Family and the Vogue, in 1946, and operated it into the mid-1950's. It closed its doors forever about 1957. Mrs. Marie M. Brown Clark of 211 Mount Vernon N.W. was still the owner in 1958-59 when the building was for sale for $16,900. The soundproof brick theater had two gas-fueled heating plants, and was air conditioned with a well. The irregular lot is approximately 47' x 115', with a land area of 5400 square feet and approximately 4500 square feet of floor space. Two small restrooms are positioned on the north side of the lobby. The building was sold to Arsulowicz Brothers Mortuaries, and has for many years been used as the Guest House, for banquets and funeral receptions.